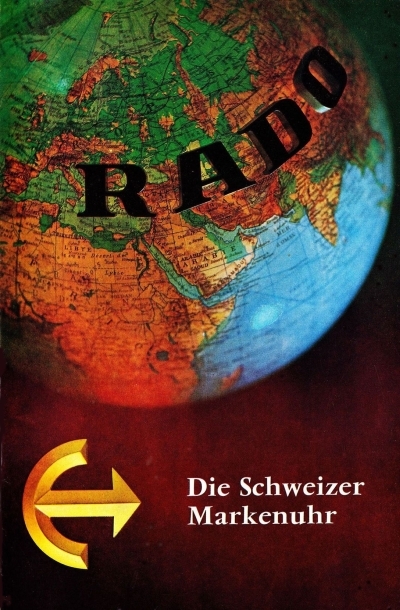 ... is not an official homepage of the Rado Watch Co. Ltd. in Lengnau, Switzerland. Welcome to my private homepage about the interesting designs and the amazing variety of vintage-watches produced under the world-famous Rado-brand. Questions? Any info still not to find on this HP? Searching for a special Rado or sparepart or have an offer? There is, of course free of cost, the vintage-RADO forum for the readers of this HP to communicate, exchange of information and for offers and searches of/for watches and parts. So just register and post! vintage-RADO at Pinterest - here you can find historical catalogues, brochures, booklets and further ads. Multiple clicks on the individual pictures or pages will bring them to their original size and make it possible to watch them with all details. Some pages (those with more text-content) exist both in German and English, to recognise from the little flag right on top. A click on that flag will lead to the same page in the other language. Inner the English menue, the buttons will open pages in English directly, pages in both German and English will be opened in a new window. Inner the German Menue, the buttons will open pages in German and pages in both German and English all directly. This HP is optimised for a resolution of 1920 x 1080 pixel and Firefox - to watch this site in best performance and ad-free, I recommend Firefox with Adblock Plus. The pages "RADO Modelle/Models Part I and II" are restored, the rest will follow step by step. Photobucket, my second image-hoster, has changed their terms of condition from one day to another. Now they suddenly refuse hotlinks to hosted images, except you pay a large amount for a pro-account. All of the hosted pictures on my HP, other HPs, fora etc. are replaced by stupid ads. 400 US$/year for a service which worked free for nearly ten years and still works free at other image-hosters? Seriously? Not with me! All of my pictures have to be moved now, new links have to be set. This will take a lot of time, so please show some patience. Many pics restored, info added, more pages in English available. Unfortunately many pictures disappeared and are lost, caused by the strange business policy of my first image-hoster Imageshack. Currently, I´m restoring and complementing as much as possible.